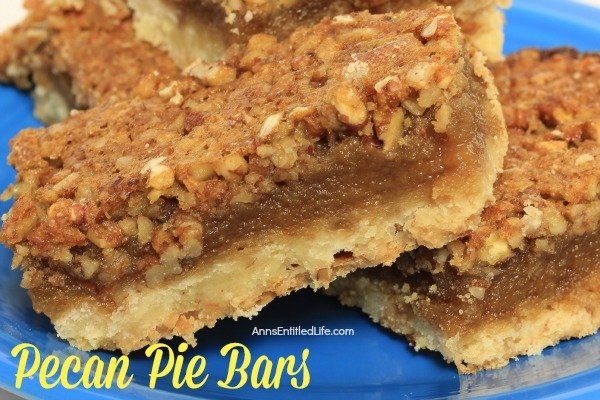 These Pecan Pie Bars are rich and delicious old fashioned pecan pie in an convenient hand-friendly, bar shape. Great for lunches, snacks and portion control, these Pecan Pie Bars are sure to delight friends and family alike. • Heat oven to 350°. • To make the crust, combine flour, butter and sugar in bowl. • By hand, cut in the butter into the dry ingredients until the mixture resembles a coarse meal. • Press crust mixture evenly onto bottom of ungreased 13″x9″ baking pan. • Bake 15-18 minutes at 350°or until edges are a light golden brown (partially baked). • To make the filling, in a mixing bowl, combine brown sugar, eggs, flour, vanilla and salt. Mix well with a mixer. • Add corn syrup, mixing until well blended. • Stir in pecans by hand. • Spread evenly over the hot, partially baked crust. • Return filled baking dish to the oven, and continue baking for 30-35 minutes at 350° or until filling is set and knife inserted 1″ from edge comes out clean. Note: these are better the second day, so if you don’t have to cut them the first day to serve, hold back. 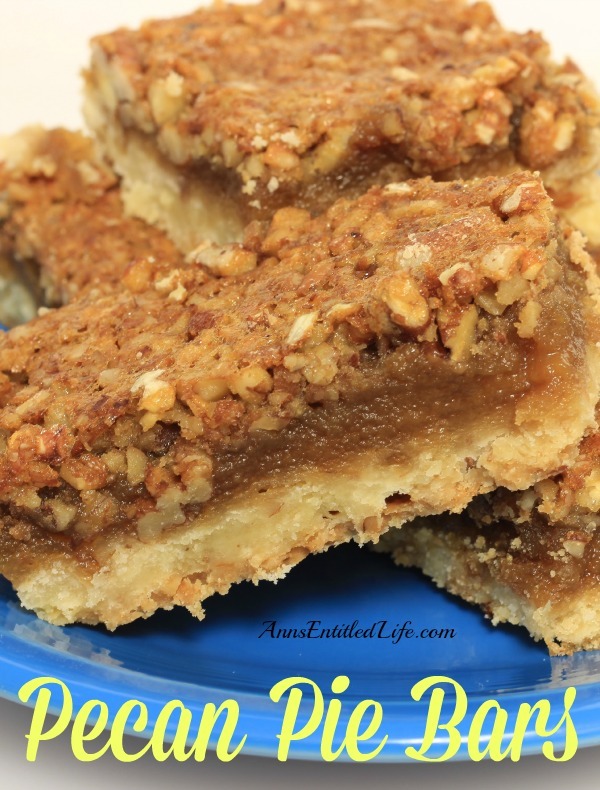 • To print the Pecan Pie Bars recipe click here. Not too good for my diet, but they do look and sound mouth-watering great. Looks so yummy, OMG… Can I have some ?? Please…. My dad is getting these for his birthday WOOOHOO! He is going to go nuts (pun intended)! Wow, I think I will have to try these for my husband’s birthday. He loves pecan pie! Thanks so much for sharing at Inspire Me Mondays! Oh I love pecan pie. This looks soooo good. Pinned it and sharing, too. I love pecan pie! I bet these would be so wonderful, and much more portable too. 🙂 I hope you can stop on by and share this or any other recipe with us on Five Friday Finds! I love anything pecan! These look great. Thanks for the recipe! My mom has a recipe for pecan tarts that sounds similar, and she can barely keep our hands off of them when she makes them. I need to try your bars recipe! Thanks for sharing at Merry Monday party.